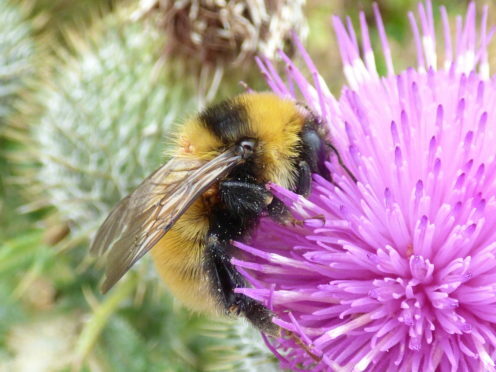 A nature body is gearing up to stem the dramatic decline in a species of bumblebee. The Great Yellow, once common in mainland UK, is now confined to a handful of colonies in the far north of Scotland. The Bumblebee Conservation Trust fears that numbers are so low that it could go the same way as the Short-haired bumblebee, which became extinct in the late 20th century. It is gearing up to start a two year census this summer to get a handle on the surviving gene pool, on the back of funding from Scottish Natural Heritage (SNH). It then plans a four year programme to support the colonies and help them thrive to ensure the species does not die out. “This is a very high priority for us,” the trust’s bumblebee conservation officer Katy Malone said yesterday. “The first thing we need to do is to do an intensive census on the Great Yellows. She said that on the UK mainland, the species is known to exist only in Caithness and north-west Sutherland. Mrs Malone said, like other bumblebees, the Great Yellow has been badly hit by the change in farm practice from hay-making to silage. She said the trust continues to have excellent support from Caithness Bioversity Group which has been reported sightings. But she said a census is overdue to accurately update the distribution and number of surviving bees.